This is Part II of the How to Get a Good Night’s Sleep series. 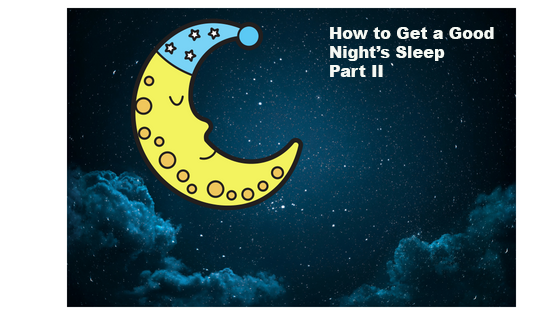 Part I has tips for prepping yourself for a good sleep as well as how to choose the right mattress and pillow, and this article — Part II — will help you to actually fall asleep. Also included in this series is a guided audio relaxation, which was made to lull you to sleep. One of the most common lifestyle complaints — especially from women over 50 — is the inability to get a good night’s sleep. Some people have trouble falling asleep in the first place, and others have trouble staying asleep. It’s frustrating to lay in bed awake, hour after hour. We’ve all heard the usual advice, but I have some good yoga tips for a better night’s sleep that I want to share with you. The main reason most people can’t sleep is because their minds are too active. Nineteen years of practicing a contemplative style of yoga has given me a whole arsenal of tools to quiet my mind. I’ve used all of these tips — either alone or in various combinations — and they work for me, so I hope you can find something that really works for you too. Being able to quiet the mind is a practice, and the more you practice something, the better you get. So if you use one of these techniques, and your mind starts acting up again, stay calm and just do the technique again. Don’t give up, because eventually you will be the master of your mind instead of the mind being your master! First things first: If you find yourself wide awake, stay calm. Although sleep is the goal, resting peacefully is the next best thing. Resting is also rejuvenating for the body and mind, and you will likely feel pretty decent in the morning. But angrily flailing about all night will make you feel awful. When I say resting, I mean laying in bed comfortably in the dark with eyes closed, practicing the following techniques. Reading and watching TV may be relaxing, but they are not resting because the mind is working. Practice the tips in Part I to set yourself up for the possibility of a better night’s sleep. Don’t look at the clock! Many people go into a panic from repeatedly looking at the clock and calculating how many hours are left until they have to get up. This will not help you. Let it go. Go through your day backward. This is good thing to do when you are first trying to fall asleep. Start with the last thing you did, and go backwards through the day. It’s important to simply list the items without going into detail, and it’s important to go backwards so you aren’t tempted to create a story or think of things you should have or could have done. Hopefully you’ll be asleep before you get to the morning. Systematically relax your body from head to toe. Relax your head, relax the muscles in your face, relax your throat, etc. Slowly, quietly, go through your whole body. You will feel the tension melt. Do yoga breathing. You can do the quiet, basic yoga breath or the louder ujjayi breath if it won’t disturb anyone. Focusing on your breath harnesses the mind. The mind is either jumping all over the place or repeating some loop. Breathe, and invite the mind to settle down and watch the breath. If the mind gets noisy again, just start over. Keep focusing your attention on your breath instead of your thoughts. The mind settles, and the breath lulls you into a more relaxed state. Consciously push your energy down. When we’re awake in the middle of the night, the mind is active. That means most of our energy is located in our heads. If we can move our energy down to the belly, the mind will automatically quiet. The ancients mapped out our energy as a series of chakras, or wheels of energy, that run down the center of our bodies from the crown of the head to the pelvis. Whether that is meaningful to you or not, this technique will still work. Focus on the energy in your head. Try to feel it. There’s a subtle aliveness there. Now imagine some sort of cosmic plunger (or whatever image works for you) that gently pushes the energy in your head down to your throat. Take a moment to feel that energy there. Sometimes it may pop back up to the head; just push it down again. Once it’s in the throat, push it down to the chest. Feel it in the chest, then push it down to the solar plexus. From there, push it down to the belly. You can even rest your hands on your belly to encourage the energy to stay there. Once the energy is there, you are likely very close to falling asleep. In your waking hours you can reverse this process if you’re feeling sluggish and need to move some energy upward. For example, having energy in the solar plexus will help you get things done. Listen to a guided relaxation. It’s wonderful to have someone else sing a lullaby, read a bedtime story, or talk you into a relaxed, sleepy state. But most of us haven’t experienced that since we were little children. A guided relaxation will help you relax and slip into sleep. Of course you have to find one that suits you. Click here to try this one. If it doesn’t work for you, keep looking for one that you like. Personally, I prefer guided relaxations that are short. That way, they guide me in but leave space for my own journey. I find it hard to sleep or go into Savasana if someone is talking the whole time. Let the mind go. This is a quick, simple technique but it may be the most difficult if you haven’t done much yoga or meditation. But give it a try anyway — it might work! When the mind is busy, relax the tension in your forehead and simply release the mind the same way you would release a balloon. Just let it go. Alternatively, you can soften the forehead and imagine the mind sinking down into its own little hammock for the night. Sit up and meditate. If nothing is working, sit up and meditate. To truly meditate, you have to sit up — you can’t lay down. Sit up straight. You can prop your back up with pillows. Close your eyes and focus on your breath. If the mind is especially active, you might want to count your breaths, but just count from 1 to 6 and start over so you don’t involve your mind in a lot of work. Eventually let go of the counting, and when the mind is getting quiet, you’ll let go of focusing on the breath. You should be ready for sleep or peaceful relaxation soon after. Try these tips, and let me know how they work for you. Remember, if you fall asleep and wake up again, stay calm and just do it again. The more you practice, the easier it gets.